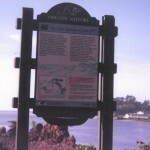 During the 18th century, Native American villages occupied the mouths of nearly every stream along this coastline-including here at Siletz Bay. Since native peoples probably had little idea about the relationship between earthquakes and tsunamis, they were taken by surprise in January 1700, when this beach was hit by a devastating tsunami. References to great flooding and ground shaking events in the oral traditions of many Pacific Northwest coastal tribes are probably the records of this event. On January 26, 1700, the earth shook violently in the throes of a magnitude 9+ earthquake that occurred along the great offshore fault system called the Cascadia Subduction Zone. From northern California to British Columbia, the ocean floor heaved upward approximately 20 feet, and within 10-30 minutes a giant wave up to 50 feet high reached the shore. The wave probably struck this beach only 20 minutes after the earthquake. Devastaing waves from this event continued to strike the entire coastline for several hours, flooding beaches, bays, tidal channels, and marshes. -Protect yourself during the earthquake. After the earthquake, travel immediately inland and up hill along designated Tsunami Evacuation Routes. -Do not return to the beach or low-lying areas after the first tsunami wave. Dangerous waves may strike for several hours. – Wait for official notice from authourities that the danger has passed before returning. For more information about earthquakes and tsunamis contact your local emergency planning office, Oregon Emergency Management, or eth Oregon Department of Geology and Mineral Industries. 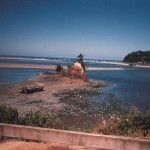 It is easy to imagine the terror, tremendous loss of life, and destruction that occurred here at Siletz Bay and along this entire coastline in the wake of the great tsunami of 1700.